The PLO’s position certainly did not improve from the end of the 1980s. This was the result of both the loss of diplomatic support from the Soviet Union, which was breaking up, as well as the pro-Iraq position adopted by the PLO leadership during the Kuwait crisis of 1990-1991. In response, Kuwait, Saudi Arabia and other Gulf States discontinued all financial support and expelled thousands of Palestinian labourers. As a result, the PLO was soon in dire financial straits. 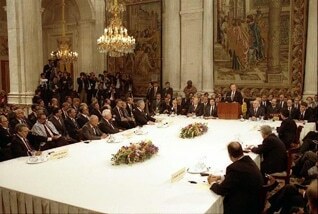 After the expulsion of Iraq from Kuwait on 30 October 1991, the United States convened the Conference of Madrid in Spain with the object of effecting a settlement between the Arab states and Israel. Bilateral negotiations followed the plenary session. However, Israel refused to adopt a multilateral approach in which the Palestinian problem would be addressed. Although the PLO was not represented in Madrid, Israel did consent to the presence of leaders from Palestine (except for East Jerusalem) in the Jordanian delegation. This was, in itself, a remarkable construction, given that Jordan had renounced its claims to the West Bank three years earlier. Moreover, as a result, the Jordanian delegation was twice the size of the other Arab delegations. In order not to be played off against one another, the leaders from Palestine coordinated their positions with that of the PLO. The negotiations dragged on until August 1993, without any concrete results. As it turned out, at the same time, in the utmost secrecy, Israel and the PLO had entered into direct negotiations – outside ‘Madrid’. These negotiations took place in Oslo, with Norwegian mediation. Even the Palestinian delegation at the Madrid negotiations had not been informed about the talks (delegation leader Haidar Abdel Shafi (Haydar Abd al-Shafi) found out about the talks from a radio announcement and he subsequently resigned in protest). In 1993, the negotiations led to what is known as the Oslo Accords.